Precious metals kicked off the new trading year Wednesday with modest gains. 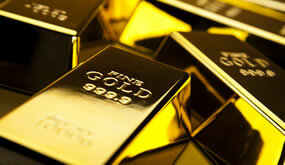 Silver and gold marked fresh milestone highs that ranged from more than five months to nearly seven months. Gold for February delivery rose $2.80, or 0.2%, to settle at $1,284.10 an ounce on the Comex division of the New York Mercantile Exchange. The settlement was the highest since June 14 when gold ended at $1,308.30 an ounce. "There was some more safe-haven buying interest amid still wobbly U.S. and world stock markets. However, the main feature today was chart-based buying amid a much-improved near-term technical posture," Jim Wyckoff, a senior analyst at Kitco Metals Inc., said in a report. "The yellow metal is now closing in on psychological resistance at the $1,300.00 level, which if cleared would attract even more speculative buying interest." Gold futures ranged from a low of $1,280.60 to a high of $1,291. They dipped 0.1% on Monday, closing out 2018 with a 2.1% decline. Ending higher for a sixth straight session, silver for March delivery tacked on 10.9 cents, or 0.7%, to $15.649 an ounce. The settlement was the highest since the precious metal ended at $15.812 an ounce on July 16. Silver futures traded between $15.38 and $15.68. On Monday, they rose 0.7% to end 2018 with an annual loss of 9.4%. April platinum gained $3.40, or 0.4%, to $804 an ounce, ranging from $787.90 to $805.60. Palladium for March delivery added $1.60, or 0.1%, to $1,198.80 an ounce, trading between $1,190.10 and $1,200.90. Gold added $1.25, or 0.1%, to $1,282.90 an ounce. Silver declined 2.5 cents, or 0.2%, to $15.44 an ounce.